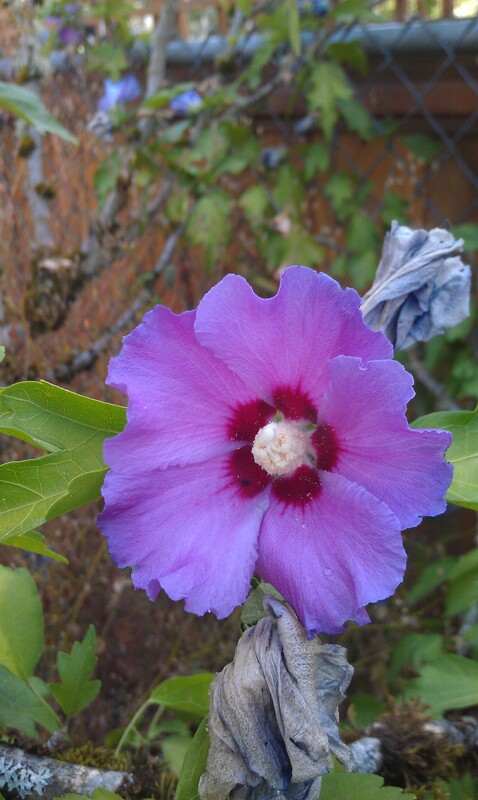 Rose of Sharon – Bring Me a Medicinal Shrubbery! Matt and I purchased and moved into our first home back in February. At that time we had many small shrubs and trees that were bare and very difficult to identify. By Spring the lilacs, tulip trees, dogwoods, and the various (very old) roses were in full bloom or leaf. Except for a very large shrub in the North East corner of our backyard/garden area. She took forever to leaf out and I was convinced may not even come back to life this Spring. Our wonderful neighbors to the North however had the scoop on everything that had to do with the previous owners including plant identification. 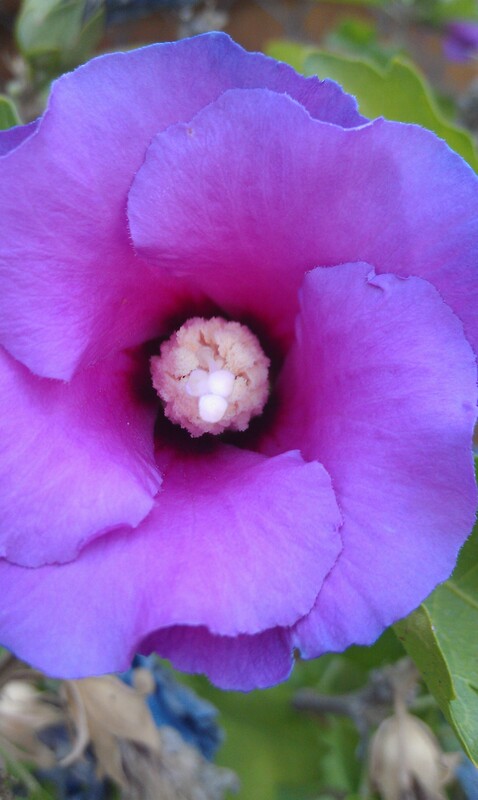 Apparently the unknown shrubbery is a Rose of Sharon and yes she does bloom. By June however I was very disappointed with the lack of any blooming and thought that perhaps the neighbors were a bit off. It wasn’t until early July that a bit of purple caught my eye in the sea of green. I thought perhaps I was seeing things when I investigated further – lo and behold a beautiful lavender/purple flower was unfurling. The first of the season! Now it is early August and the blooms keep coming. 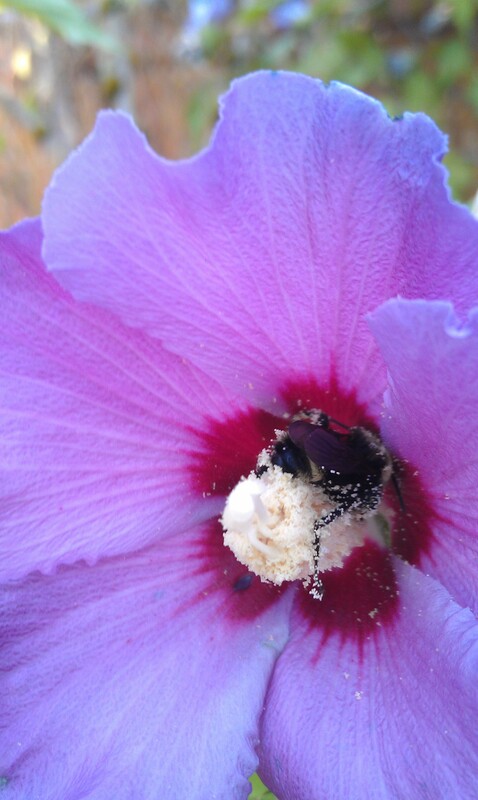 Hummingbirds, ants, bumblebees, honeybees all enjoy the luscious pollen and nectar. Anyone who comes to the house and notices the large shrub are astounded by the size of her! She is as old as the house which was built around 1952 and has at least five different branching limbs all of which shade that part of the garden and block our watering. Sigh. Matt has been slightly terrified that I will do some research to see if the Rose of Sharon has any medicinal properties (because then I would be less ok with us trimming or taking her out). Guess what? She does! Rose of Sharon or Hibiscus spp. (the species could be syriacus) of the Malvaceae family aka the mallows are deciduous shrubs native to Asia. The shrub is highly prized for the beautiful flowers that open during mid-summer which can be a wonderful addition to a home landscape when all other flowers are done by June. What most people are unaware of (including myself up until just recently) is that the entire shrub is edible and medicinal. Eat the flowers raw or added to salads for a splash of color. The taste is very mild, not sweet or bitter – come to think of it very ‘mallow’ like if you have eaten any mallows. The young leaves can be eaten raw or cooked however I can’t say from experience about the flavor since it is too late in the season to eat them that way. Apparently the root is also edible but I don’t see any reason to dig it up just to eat. Now medicinally I find this exciting. I never would have thought it would be in the Malvaceae family that is until I took a petal and squeezed it between my fingers. It was slimy! And boy do I get excited about slime or to be more technical – mucilage. Mucilage is our mucous membranes best friend whether internally or externally. Or other exciting terms are demulcent, soothing on the inside, or emollient, soothing to the outside. Sometimes I get overwhelmed by the various medicinal uses of plants that are new to me. I see the list of actions such as the ones for Rose of Sharon: antipyretic, diuretic, stomachic, styptic etc. and understand what the words mean but don’t necessarily understand how to use them medicinally. So instead I break it down to my level of how I would use this plant and what she offers. So let’s just stick with the slime. Mucilagenous substances soothes, heals, protects, any mucous membrane in your body. Mucopolysaccharides or mucous with many sugars, when ingested coats the inside of your body. When they reach your large intestine they are partially broken down by the bowel flora and long story short becomes a ‘pre-biotic’ because it feeds the good flora in your gut. Thus giving you good intestinal health and soothing. Now think of inflamed situations in the GI tract that Rose of Sharon could soothe: heartburn, ulcers, IBS, colitis etc. One herb I always like to use if I have a urinary tract infection is marshmallow because the mucilage will also coat my urinary tract, reduce swelling, cool the fire, and heal the membranes. The Rose of Sharon can be a wonderful substitute since I don’t have marshmallow growing in my garden. As an emollient the mucilage will help bring down inflammation from ailments such as rashes, burns, bites, and stings. If using a dried powdered form of demulcent and you add just a little bit of water it will actually act like an astringent in that it will dry, draw, and shrink tissue. I am excited to try it on poison oak dermatitis. The leaves, flowers, bark and root bark can all be utilized as medicine. I would use the leaves and flowers as a demulcent. One article I read suggested drying the flowers and powdering them to keep on had for adding to tooth powders, facial exfoliants, or even added in to body butters. Here is the link to the neat blog about that. Make the leaves and flowers into tea for internal soothing or even make an herbal oil with the flowers. It is possible to use the bark for demulcent qualities as well. The root bark may be used as a febrifuge and even a vermifuge. As far as I can tell Rose of Sharon is a very safe plant without many or any contraindications. As always be careful if you are pregnant or are on a cocktail of drugs. I end my report with this: sorry honey the Rose of Sharon ain’t going anywhere! A couple weekends ago my husband Matt, my apprentice Fox, my co-worker Miriam and I went on our first Nettle harvest of the year. The crop was young and the plants were no more than five inches tall. This particular stand of Nettles I had not visited for several years and was curious to see if I could spot any changes to the health of the stand. Since only about 30% of the colony has even sprouted I found it difficult to judge. However, I could still see many of last years dead stalks which was an indicator as to how dense, tall, and spread out the plants have grown. I explained to my apprentice how best to caretake this particular plant so that it will still thrive in the seasons to come. I showed her how I like to clip just above the second or third node from the top so that within a few weeks it will re-sprout another (or maybe even two) new tops. 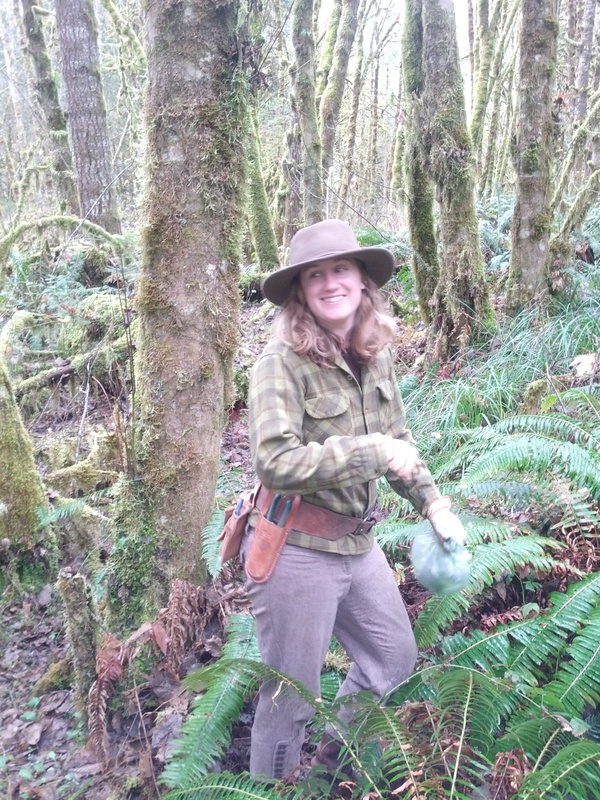 Harvesting Stinging Nettle that day was also an excuse for me to try out my newly designed harvesting belt. It isn’t very fancy, simply a carpenter’s belt found at Goodwill with a carpenter’s pouch still attached. On the left side of the belt I chose to attach my Mora knife and on the right my hand clippers. Soon I hope to add a Hori Hori knife to my belt once I get a nice one. I was impressed with the ease of using the belt that day. 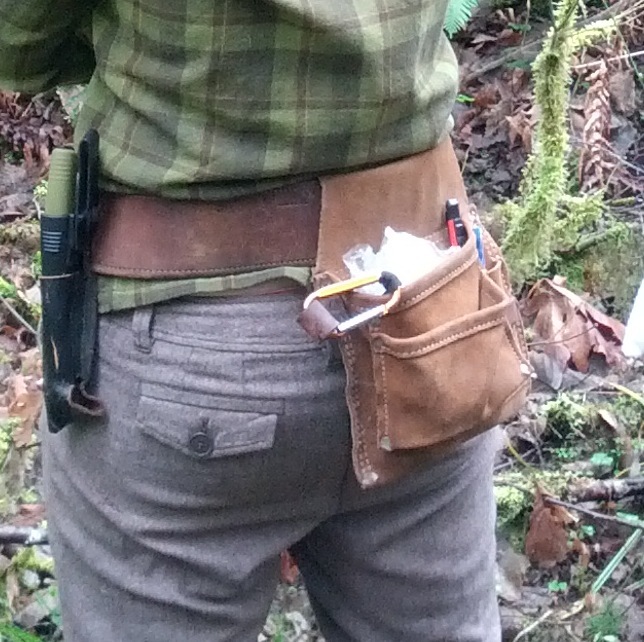 I could easily reach behind me to grab something and my clipper holster was always right there for easy grabbing. In conclusion – I loved it! I am sure there will be improvements in the future but for now it’s juuuuuust right. 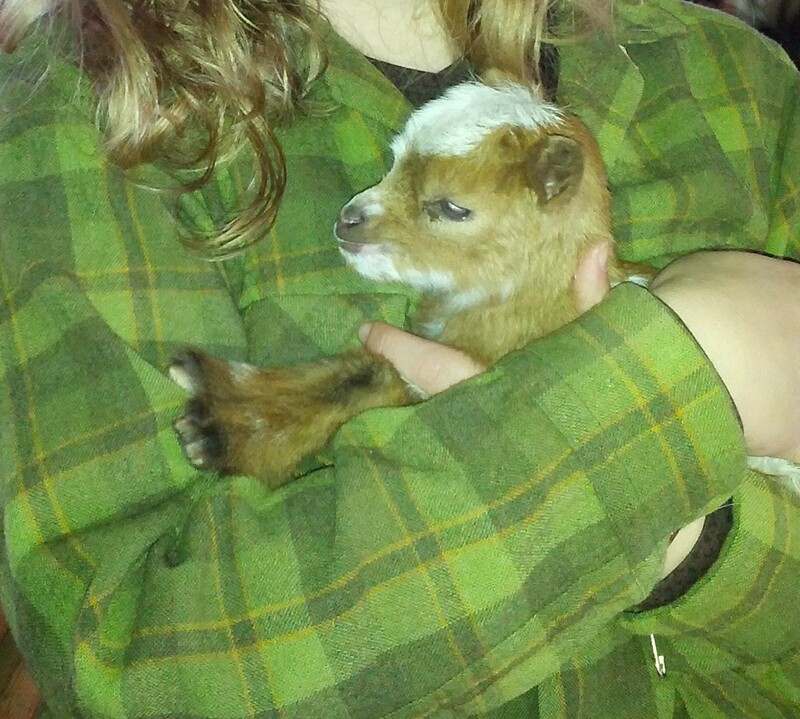 Now I will leave you with a picture of a premature baby goat named Whiskey. For our Wednesday evening meal we decided to do a regular stir fry with the buds and hearts of a dandelion and the leaves and bulbs of wild onions. During one of our Coyote Kids! 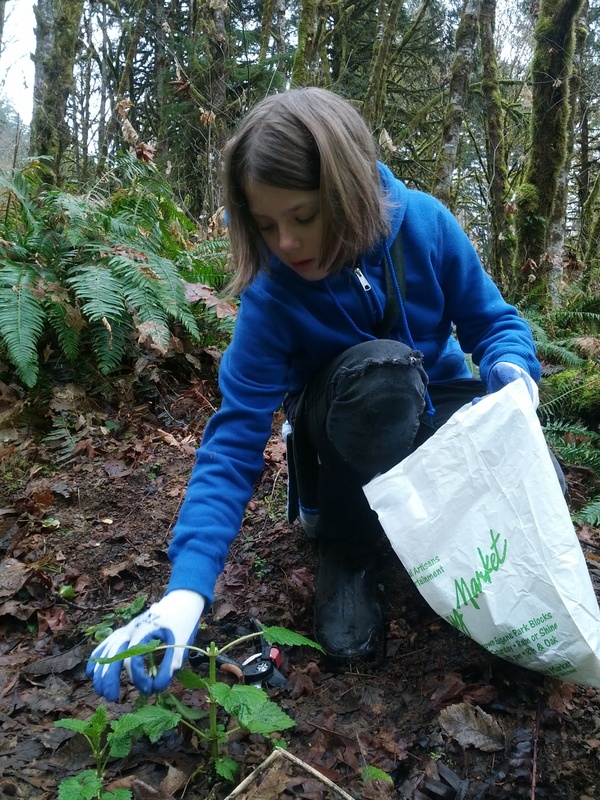 after school program we decided to show the kids what an entire dandelion plant looks like. We found a beautiful plant with a very large root and told the kids how one can eat the entire plant at certain stages of growth. After the program we brought the dandelion home for our meal. The picture below isn’t the plant we harvestesd it was just way cool cause all those flowers are on one plant! To get to the heart of the dandelion simply cut away the root stalk where it meets upper section of the plant where the leaves begin to come out. Then cut just below where the leaves begin to form. You will have generally an inch or so of plant matter that is considered the ‘heart’. We also threw in the buds, the little unopened flower heads. I was really surprised how much one teeny flower bud can pack such a bitter punch! It really gave the meal a powerful kick. I wasn’t a fan of the dandelion hearts because they were way too bitter for me. Matt seemed to really enjoy them and even liked them better than the fiddleheads we had. To each his own. Day two of wild foods extravaganza! Tonight we decided to go for a more native plant that is growing in our back yard. The beautiful and rather controversial edible, bracken fern fiddleheads. Bracken fern or Pteridium aquilinum can be found in many of Eugene’s coniferous forests and have deep rhizomes underneath the soil. Each year the fiddleheads come up out of the ground in Spring and (right now is perfect fiddlehead season!) then die off in the fall leaving behind fern skeletons to eventually decompose. 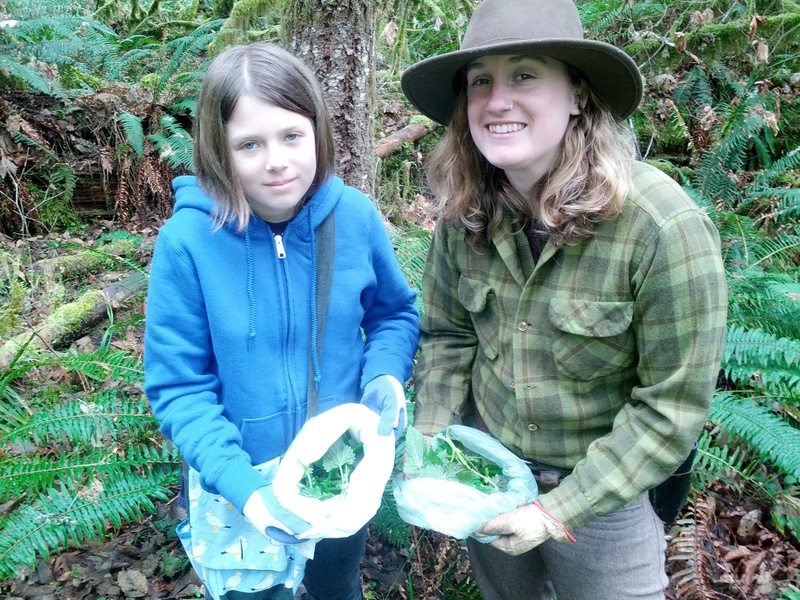 Harvesting fiddleheads is fairly simple. The little shoots are surprisingly hard to find as they are skinny and are dark green to purple in color so they blend in well. However if you look for the fern skeletons of the previous season you will find the little plants growing up in the same area because of the underground root system. Clip the stem a couple inches below the unfurling leaf. Be sure that the leaf is still well curled as this is the time when the plant is most edible. If you see the leaf beginning to take shape then leave those plants – you may be too late in the season. To prepare the plant put a couple of inches of water in a pot, place the heads inside and let them steam for 4-5 minutes. You may add whatever topping you would like to suit your taste. We added butter because the fat really helps with the bitterness. I was really surprised by the taste. On first bite I was struck with the bitterness not unlike asparagus, however the after taste strongly resembles anise. Very interesting! We shared our fiddlehead meal with a very tasty baked chicken. Caution: Bracken fern is not known for acute poisoning however it has been researched and noted that after mass consumption or regular consumption people have been more susceptible to cancers. The leaves are generally thought to be carcinogenic though this will take time to accumulate in ones body. In countries like Japan fiddleheads are consumed on a regular basis as a good food. Eating this plant raw can cause a deficiency of Vitamin B1 which causes the body to reduce its thiamine levels however cooking it is believed to eliminate the problem. The ironic thing is that I read that bracken has been eaten as a treatment for cancer…ahhh plants. As always approach eating wild edibles with caution. Every body is different so start slow and monitor your body’s reaction to the foods you consume. Have fun with it but understand the risks. I just spoke with a friend of mine who lives in Texas and is the mother of a young boy. She told me that she had just taken her son to the doctor for several very infected spider bites and was prescribed strong antibiotics. I gave her some unsolicited advice that I believe every parent should know. It is a particular remedy for those scary spider bites, itchy mosquito bites, terrible bee stings, infected wounds, painful splinters, and the key to prevent doctor visits for antibiotics for any of the aforementioned. It is simply a weed. A weed that grows underfoot. A weed that invades your lawn. A weed that has been used for thousands of years all over the world. And a weed that was called “mother of herbs” by the Anglo-Saxons. 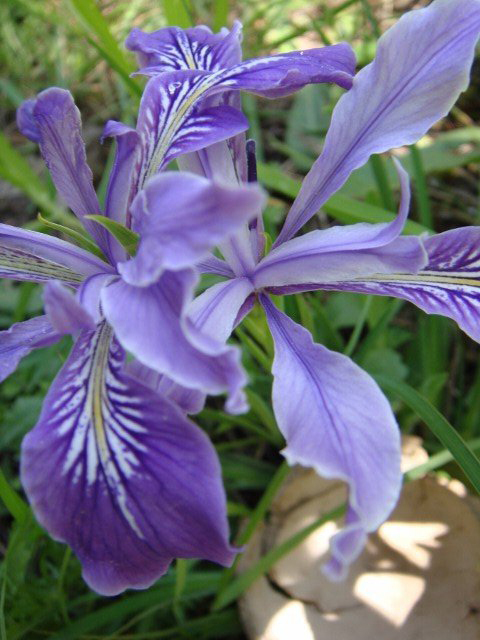 First and foremost before we use any plant for any reason is to safely and correctly identify it. Plantain is not the tropical fruit but rather a perennial weed that is found throughout the world with more than 200 species in the Plantago genus. One species you may know well is Psyllium Seed Husks for troubles with digestion. Same genus! The species I am most interested in are Plantago major and Plantago lanceolata simply because those are the two species that grow in my lawn. Plantago major or Common Plantain have oval shaped leaves while Plantago lanceolata has spear shaped leaves. Both species grow in a basal rosette and have veins that run parallel or like train tracks from leaf stem to leaf edge. As mentioned before Plantain loves to take over lawns, and you will most likely find them in disturbed fields, along road sides, along the sidewalk as you walk to work, and where soil has been disturbed or packed. Here is a picture of a huge Common Plantain found at Armitage Park last month. Now, once correctly identified, how do you use it? Plantain is well known for it’s drawing capabilities. Once I had a splinter deep in my finger and I worked on that sucker for a good 10 minutes to no avail. I came across some Plantain and picked a nice, clean, healthy leaf, stuck it in my mouth and chewed it to a pulp. I spit it out onto my finger and held it there for 3 minutes. After I removed the pulp I squeezed my finger and out popped the splinter! It’s no magic trick (though sometimes it is nice to give a little mystery to kids) it’s chemistry. Plantain is very astringent and this quality makes for good pulling (things out including infection), stopping (such as bleeding), and closing (tissue together from a wound). No matter what kind of camp or program I am teaching Plantain always finds a way to teach a lesson to kids. This summer we are teaching an array of summer camps for kids and one topic that always comes up are bee stings. Plantain can pull out the venom from a bee sting, reduce the swelling, kill any bad bacteria that may have been present, and can reduce the risk of major allergic reaction. Yes please! The best way to apply Plantain is the method I described above for my splinter. Chewing it like gum can get the medicine working internally as well as externally. Now if you are a bit squeamish about chewing up a plant you can always squish it between your fingers really well or between rocks. This method is called a poultice. Depending upon the severity of the wound you may need only one application or ten. A story I will leave you with is one I enjoy telling when I am introducing Plantain. One day I was working with a bunch of adults making bow drill kits for friction fire. Before I sat down in the gravel I decided to walk by a patch of grass and took notice of a couple Plantain plants. Then I started my grueling task of making a bowdrill kit from scratch. After a couple of hours in the sun I was getting hot, tired, and cranky. My knife slipped and I saw a rather deep cut slice just above my knuckle on my left pointer finger. Without hesitation I got up walked to the patch of grass, found a Plantain leaf, chewed her up and slapped her on. I applied pressure and held up my hand for three to four minutes. When I felt that the blood had clotted I removed the pulp and found the cleanest cut I had ever seen. The Plantain had completely stopped the bleeding and cleaned up the blood and I could already tell that the tissue was trying to stitch itself back together. It barely scarred, just enough to be able to show it off. When in need Plantain will magically appear. Please be sensible about harvesting plants for first aid. Know your plants well before applications and be aware of your limitations. Once you build a relationship with Plantain she will be one of your most important allies! Tom Brown’s Field Guide Wild Edible and Medicinal Plants Tom Brown Jr. Visiting home is always such a bittersweet occasion, but the older I get the sweeter it seems and the less bitter the bite. I grew up in a town very opposite from Eugene – geographically and mentality wise. Baker City is in fact not in California as most people presume but rather is nearly as far on the Eastern side of Oregon as one can get. Located 2 hours west of Boise, Idaho, Baker City is nestled between two ancient mountain ranges (the Elkhorn Mountains and the Wallowa Mountains) and surrounded by Sagebrush/Juniper/Rabbitbrush communities. You don’t have to go far to get out of the desert – travel up to the mountains for an hour and you will find yourself at an elevation of 7,000 feet! I make it a point to visit Baker City every year as my father, grandmother, and extended family still live there. The Sieg family have been in the valley for generations and grandma can still remember stories from her great aunt about traveling the Oregon Trail. Snowberry, Oregon Grape, California Mugwort, Larch, Rabbitbrush, Stinging Nettle (I knew it was around but never noticed the abundance), Indian Poke, and Elderberry to name a few. This knowledge humbled me – the idea that I can grow up in a place and ‘think’ I know it, but come back in a few years and realize a whole new world is there in front of me. I visited one of the only bookstores in town, Betty’s Books. I used to work there in high school and am good friends with the proprietors. At the store I picked up an awesome book that stayed with me all week. Medicinal herb books of the high desert region are not abundant so this one is a real gem. The book is called Healing Plants of the Rocky Mountains by Darcy Williamson. Williamson gives great descriptions, harvesting, uses, and recipes for these high desert plants. I was most excited to learn about medicinal uses for Sagebrush other than just for incense. To get to the point of this blog I will give you a list of the plants that I was able to harvest and what I plan to do with them. Catnip Nepeta cataria Found it growing next to a creek near the Wallowas. Gathered a few flowering stalks and put them in a jar to make an alcohol tincture. Elderberry Sambucus spp. Grows abundantly along creek sides. Gathered berries mostly south of Baker near Durkee. Garbled berries and put them in quart jar to make an alcohol tincture. Freezing the rest to eventually make a syrup*. Juniper Juniperus spp. Junipers tend to grow on the south side of Baker Valley. I collected the ‘berries’ which are actually cones and am drying them in a food drier in order to eat them to help my hypoglycemia. Pitch Pinus and Abies I am collecting pitch off of Pine and Fir trees so I can make a pitch based incense. Rose Hips Rosa spp. So many Rose bushes and they are loaded with beautiful red hips. I found them growing along roadsides, creek sides, and southern slopes. The best time to gather hips is after a frost which there luckily were a few nights that got down to freezing level while we were there. I gathered the reddest hips possible and am in the process of cutting them in half, taking out the seeds and drying them to use in teas and to possibly add to honey for a Rose Hip honey mixture. Sagebrush Artemisia spp. Sagebrush grows all over Eastern Oregon but is tending to take over habitats it normally would have stayed away from because of over-grazing etc. in the past. I gathered enough leaves to fill at least a quart bag. Made part of it into an alcohol tincture, oil, and am drying the rest for incense and teas. Sagebrush is strongly anti-fungal and so is great for foot fungus. If you ever get a chance and live in or near Oregon take a trip to Eastern Oregon! The high desert is breathtaking, diverse, and full of wildlife. We saw Pronghorn, heard Elk bugling, Coyotes, Mountain Goats, Jackrabbits, Golden Eagles, many species of Hawks, Deer, and so much more. * Here is an exciting recipe taken from Darcy Williamson’s book about how to make Elderberry Syrup. Gather berry clusters after the first hard frost. Remove the stems from berries. Place berries in a large kettle and heat slowly, mashing berries to extract juice (or put berries through a juicer). Pour juice and berries into a clean old (hole-free) pillow case and hang above a large clean kettle to allow the juice to drip overnight (if using a juicer, this process is eliminated). The next morning, measure out juice. Add an equal amount of honey. Simmer honey and juice over medium-high heat until mixture thickens to syrup consistency. Pour into sterilized bottles and seal in a boiling water bath for twenty minutes. Use as a cold preventative.